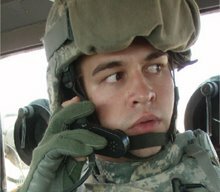 Last week you read about SSG George Nickel. You know who he is and what he's been through. Many of you emailed and commented, asking what you could do to help. The people from the Idaho Veterans Network have established the George Nickel Fund. This fund will go to pay the legal fees and costs that Staff Sergeant Nickel will incur. You can make your donation at any Wells Fargo Bank or you can send it to the branch where the fund was established.